We challenged some of our design team to scrap lift or share something that they were inspired on a project. Earlier this week you saw Wendy Sue Anderson scrap lift a Scrapbook Trends Cover. So how fitting is it that Tiffany Hood would be inspired to scrap lift a layout by Wendy. I decided to scraplift someone from our own design team. 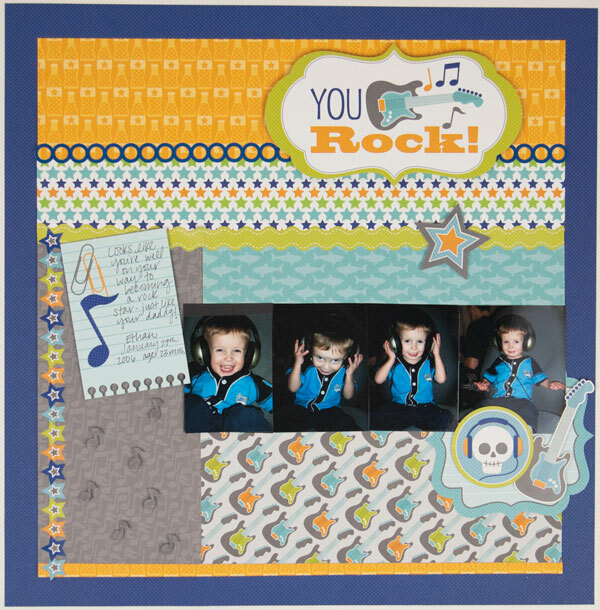 I fell in love with Wendy's "Spring" layout that she made with the "Hello Spring" collection as soon as I saw it, so I was excited to "copy" her layout using the "Boys Only" collection and photos of my son rockin' out when he was a baby. I used almost the exact same layout, changed the papers and the die cuts, and voila! A brand new page. Oh, you had me at Doodlebug. I still hoard some 12x12 circa 2005(? )...it has a lt. purple background with small dark purple, white, and lime green polka dots. I had purchased many Doodlebug papers before that, but that was when I fell in deep paper love with Doodlebug ;) Yes, I have paper issues and NO, I do not want help. I adore both your LO and Tiffany's. Your blog is always so inspiring. Thank you, Lori!